Now that we've opened Pandora's Box with this bike, let's go over some more features and benefits involved with the 2010 Bianchi D2 Pico Crono. 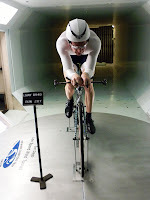 Bianchi's National Sales Manager, Jim Stevenson, took a trip mid-December 2009, to the Low Speed Wind Tunnel in San Diego for a session in the wind tunnel. This is something that anyone who is serious about dialing in their form, needs to seek out and get some testing done there. To say that our Jim is a TT enthusiast would be ever so insulting to the chap. He lives and breathes numbers on the time slips. Tire friction/resistance, grams of parts, any legal advantage possible, Jim has either implemented it or is figuring out a way to execute it. Let's take the front end of the 2010 Pico Crono in which JS is riding in 2010. I was pleased to see the installation of a new front brake assembly. Look closely...for those of you under the age of 35 are probably scratching your heads right now. Viewers of 35+ years old, yes, that's right, Jim has installed a Campagnolo Delta front brake. The reason for this change is simply to clean up the front end of the bike. Honestly, I believe he knew dang well that a Bianchi should have some Campy stink hanging off it somewhere, but hey, that's just me. Side view. Bars are nice and low, good position from here. Jim hasn't submitted to me the results of the test but in his last email about the trip to LSWT it read... the bad news is that I am super aero and my drag numbers are VERY low. That means the only way to go faster is to pedal harder and suffer more. Jim removed the stock FSA chain ring for an ultra light TISO ring--170 grams final ring weight. Other than the wheel set, front brake and large chain ring swap, this carbon fiber monocoque constructed bike is stock. Another note here is that the factory fork is full carbon as well. Toho IM600 carbon fiber is utilized throughout the frame and fork. This is the same grade of carbon fiber that we use on the beloved Mono-Q frame and one of the genetic ingredients from our 2008-2009 B4P T-Cube frame set. I've ridden both the Mono-Q and T-Cube frames and I love the way the IM600 behaves in frame form. Fast transmission of leg power, yet not so stiff and harsh of a ride that your spine feels like it will pop out the top of your head like the 'Finish Him' mode of the Mortal Combat video game on the old Sega Genesis. The front view shows that Jim has his head up just high enough so that he's able to close the hole between his biceps by lowering his head. This is done to reduce the amount of wind that his chest might be taking on. Wind is all around when cycling and a test of the rider and their equipment is a must when you're racing against the clock. Suction or drag when created across a surface of the rider and/or bicycle can be a bad thing so the broad chain stays of the Pico Crono have been punched out for that extra little measure. As a wheel spins, turbulence is generated between the spoke surface the inside of the bicycle frame or fork, for that matter. 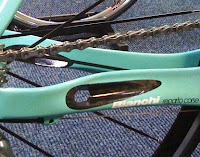 The chain stay as shown above on the 2009 D2 Carbon Crono (same for the 2010 Pico Crono too.) has been carved out and then in-laid with more carbon to create more surface area, stiffen up the chain stay and act as a port, assisting in drag and turbulence reduction against the frame and wheel. 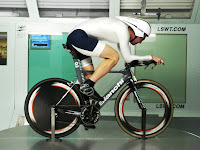 In SoCal, Jim participates in a Time Trial series where he is the 2008/2009 40+ Mens champion. Here are some of Jim's words about his maiden TT race from last weekend's 8.5 mile event. I have to say, the bike is awesome! My Felt B2 frame I've raced on the last three years had an older, heavier fork with an alloy steer tube. The full carbon fork on the Pico made the front end so much accommodating. And I don't know if I just got lucky setting up my position or what, but I was always moving around on the saddle on the Felt trying to get comfortable but that was just a non-issue yesterday. ...in a land of Cervelo's and Felt's, the bike made quite an impact and everyone was checking it out before and after the race. In three years of racing the SoCal TT circuit, I've only seen one other Bianchi TT bike out there (public class)-- the older version of the Crono. Everyone drilled me about it and wanted know why I switched, especially after being a staunch Felt advocate for the last few years and selling several of my friends on one. Based on my first race on it and my recent wind tunnel tests with the bike, I'd put the bike up against the industry standard Cervelo P3 any day, and I'd recommend it for anyone looking for a race bike for triathlon or time trials. Its a good feeling to have the confidence of practicing what you preach. I see are always enjoyable. First, to the blogger from Japan. Awesome site!!! Will, to be fair to the B2, which was an awesome bike, the fork I built it with was an old fork out of my garage and not representative of what Felt delivers with the B2. For positioning, I was very careful to document my dimensions before switching out frames. The TT on the Medium Pico Crono is 16mm shorter than the 56cm B2. I ended up adding 20mm to the stem length, gaining 4mm in overall reach--which I must say is feeling good.